Exciting News in may 2018: Sometimes silent as my election as official member of the „Bavarian Academy of Fine Arts“ or my nomination as „Honorary Artistic Advisor“ of Guangzhou Opera House. 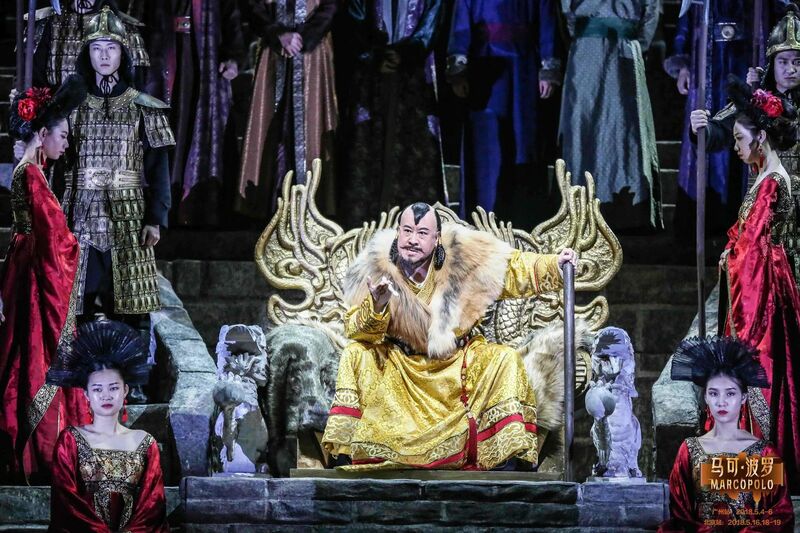 Sometimes with frenetic applause as the performances of my opera MARCO POLO (composed and sung in chinese language) in Guangzhou and Beijing. All over China it was a sensation in media and cultural life. This three hour opera was finished as piano score in october 2017, orchestrated till january 2018. The staging and rehearsals from March to May 2018 in China were unforgettable days: Working in this amazing Guangzhou Opera House (built by Zaha Hadid) with such a lot of high-professional collegues: european singers like Peter Lodahl and Elise Caluwaerts and international experienced chinese singers as Tian Haojiang, Zhou Xiaolin, Yuan Chenye, Wang Yunpeng, Liang Ning... Conductor was Muhai Tang. Amazing the work of the creative team: Kasper Holten (director), Luke Halls (stage & Video design), Bruno Poet (Light), Emmy Ryott (costumes) and Michael Barry (director of movement). COMPOSING, COMPOSING, COMPOSING..... A lot of new works, new performances are the joy in composers life! Doubtfull thoughts about honors and awards: a subtle memory - "is it likely to be the end?" ORCHESTRAL AFFAIRS IN SUMMER 2018: My second CD-recording with the Siberian State Symphony Orchestra (cond. : Vladimir Lande) in Krasnoyarsk: together with the saxophone quartet CLAIR OBSCUR from Berlin we enjoyed highlights in the philharmonic concert...but also highlights with impressive excursions in the monumental siberian landscape: at the border of River Jenissei with its 4000 km, or in the mountains visiting the Rock Pillars...one oft the most spirituel locations in Siberia. Enthusiastic reviews of the latest CD „MAGIC OF IRREALITY“ at Label WERGO distributed by NAXOS with two double concertos, recorded october 2017 with Siberian State Symphony Orchestra (Vladimir Lande, conductor) in Krasnoyarsk: Jiemin Yan (Erhu) and Wen-Sinn Yang (Cello) playing ISOLDE & TRISTAN, Otto Sauter (piccolo trumpet) and Sergei Nakariakov (flugelhorn) playing DREAMDANCERS.